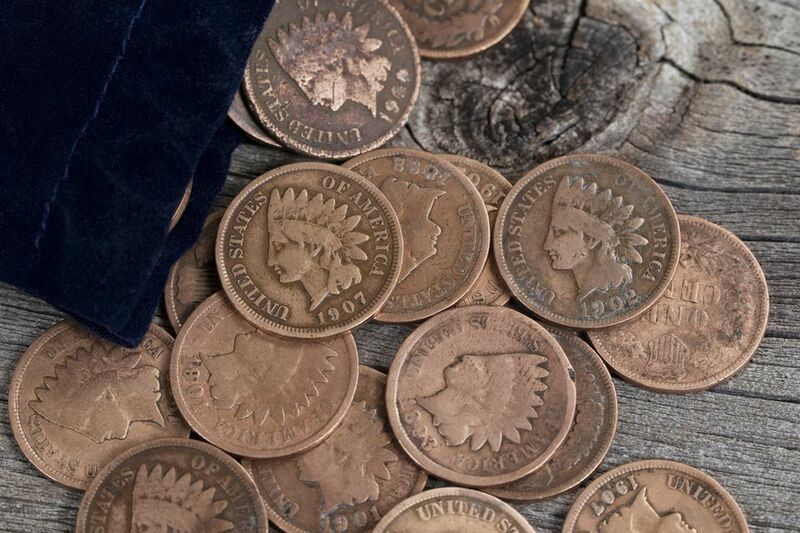 Next to the Lincoln penny, the Indian Head Penny is the most popular series of small cents collected by numismatists. Circulated examples are readily found in your favorite coin store local coin show. There are a few key coins that could stretch your coin collecting budget while you assemble your collection of Indian head pennies. by 1857 the cost of making copper coins had risen due to the increased price of copper. Mint Director James Ross Snowden noted in his annual report that the mint was barely making expenses due to the increased cost of copper used in both half cent and large cent coins. The mint ceased production of half-cent coins and reduced the size and weight of the penny. In 1857 a small cent coin was introduced that featured a flying eagle on the obverse. Production problems limited the coin to only two years. The Indian Head penny was introduced and 1859 with a composition of 88% copper and 12% nickel and a diameter of 19 mm and a weight of 4.67 grams. In 1864 the composition was changed to 95% copper and 5% tin with a reduced weight of 3.11 grams. James B. Longacre designed both the obverse and the reverse of this classic American coin. Indian Head pennies do not contain any precious metals (i.e. silver, gold, etc.). Therefore, their value is derived from demands by coin collectors. Many people collect these coins, so the market is quite active and most dealers will pay top-dollar for nice specimens. The following Indian Head pennies in any condition, are worth considerable more than common ones. As such, these coins are frequently counterfeit or altered from common Indian Head cents. Therefore, before you start celebrating your early retirement with your new found fortune, have the coin authenticated by a reputable coin dealer or third party grading service. Indian Head pennies were produced at two different mints: Philadelphia (no mint mark), and San Francisco (S). The mint mark is located on the reverse of the coin, just below the wreath. The buy price is what you can expect to pay to a dealer to purchase the coin. The sell value is what you can expect a dealer to pay to you when you sell the coin. All circulated prices and values assume that the date is readable and not completely worn off the face of the coin. The actual offer you receive from a particular coin dealer will vary depending on the actual grade of the coin and a number of other factors that determine its worth. Uncirculated specimens that exhibit original red or red-brown color are worth significantly more. Please note: You cannot increase a coin's value by cleaning it. In fact, cleaned coins are worth considerable less and coin dealers can spot a cleaned coin immediately. Therefore, never clean your coins.